Pickles and Ice Cream: A few creative ways to give MONEY! 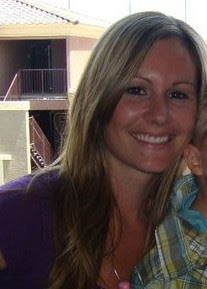 A blog with RANDOM ideas....recipes, crafts, sewing tutorials, art projects for kids, etc. A few creative ways to give MONEY! Money and Giftcards are always the perfect gift idea for birthdays, graduation, holidays...but if you are like me...you don't like just simply putting the money in the card! Well...here are a few ideas of other ways to gift the green! Tissue box Money Roll-I can't take credit for this one! See the twins above? This was all them! 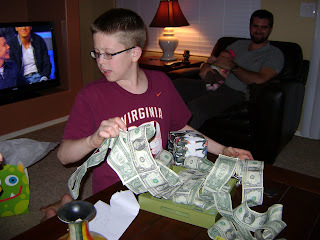 My brother turned 11 in March and they taped a whole bunch of dollar bills together, rolled it up and put it in an empty tissue box! When he opened his gift...one of the bills was sticking out and when he pulled it...it just kept coming! HE WAS CRACKING UP and thought it was the coolest thing! Also, I have read or seen a few other ideas: Making a tie for father's day, a party hat for birthday, a money tree for a wedding (my hubby and I got one)...the possibilities are endless! 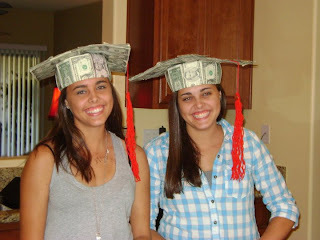 How many bills did you use for the graduation cap? For the graduation caps what did you use underneath the dollar bills? Easy and Adorable Infant Leg Warmers! What to do with your Easter eggs? ?